it´s cute. she seems to be so happy. 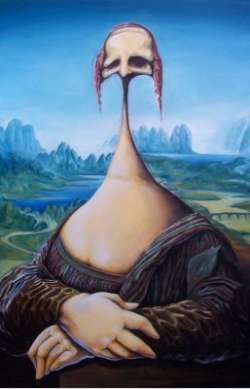 this is a mona lisa parody painted by 'celo austin' (brasilian-canadian) (oil on canvas, 50x70cm). i think it´s a bout the crazies thing i´ve ever seen. i´m not sure if the reaction is to cry or to laught at it. good stuff, though.